I am insanely-crazy about pencils therefore I keep looking for more ways to do new things. At this juncture of my design style, metal is a key signature therefore I keep adding subtle hints of it even though a lot of my work uses recycled, reclaimed and up cycled material. The metallic caps on the pencils are triangular in shape and require seven die impressions, it took us over a year to perfectly fit them on our pencils. 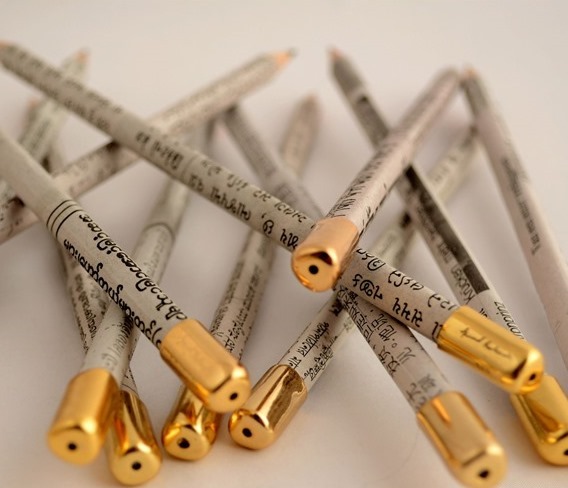 This entry was posted in Whats New and tagged Anand Prakash, Designer Pencil, Gold Plated, Pencils, stationery. Bookmark the permalink.